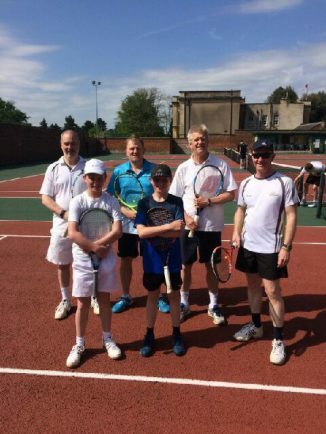 BROMSGROVE Men’s C team claimed victory in their opening summer season fixture against Wall Heath B in Division Five of the Herefordshire & Worcestershire League. The squad of John Casey (captain), Tim Wright, Voitek Ziedzwiedz, Tim Roland, Pete Morris and Trevor Errington travelled to Wall Heath where they claimed a 4-2 win. Casey and Wright at first pair won both their contests after going a set down. They showed real fighting spirit to come back and beat both the first and second Wall Heath pairs. Niedzwiedz and Errington as Bromsgrove’s second pair quickly won their opening match but lost to Wall Heath’s first pair in a close three-set match. Morris and Roland at third pair lost their opening game in three sets but beat their opposite pair convincingly. Casey said: “It was a good win in difficult conditions as the courts are affected by building work. The newly formed Men’s F team played their inaugural Division Nine match against Boughton D – a team of students from the University of Worcester. It was a baptism of fire for Bromsgrove as the athleticism and youth of Boughton proved too much as they went down 5-1. Bromsgrove youngsters Jim Round and Stu Shannon proved they’ll be tough opponents this summer as they beat Boughton’s second pair comfortably to get their first two points of the campaign. The Men’s E team also played their first match against Bewdley F in Division Eight. In an incredibly close match which was tied in both rubbers and sets, Bromsgrove won on the count back after winning by 73 games to 68. Bruce Turner with Brian Taylor won both of their rubbers and Brian Barton with Aaron Oakes won the other to level the game at 3-3. Paul Jubb with Stewart Roney fought hard in their game but could not get the better of their opponents. Elsewhere, the Ladies B travelled to Stourbridge and came away with a 4-2 victory to maintain their 100 per cent start in Division Two. Bromsgrove’s first pair of Ann Banner with Katherine Smedley won both matches and the pairs of Joan McGregor with Linda Woolley and Hannah Weston with Kelly Kenward both clinched a win apiece to secure victory.